Begging Joseph Parker’s pardon, there is really only one world heavyweight title fight that matters right now; only one that would be wholly deserving of having a Super-Fight tag attached: Anthony Joshua-Deontay Wilder. Things could change, however. Right now, it’s almost pointless talking about Tyson Fury (even if many people continue to talk about the unbeaten, never-lost-his-belts-in-the-ring former world champion; Eddie Hearn included) – for until he both sheds the excess weight he is carrying and has been carrying for well over a year and obtains a licence to box, the charismatic giant’s hands are seemingly tied in a major way. But IF, and it could be a big if on both counts, Fury gets back in shape and then gets a licence to box in the UK, we can talk. We all want to see Fury back, for a number of reasons – he has never lost, he claims he’s the best-ever and both Wilder and Joshua want to fight him – and Hearn brought up his name after AJ’s tougher than expected win over a teak-tough and gutsy Carlos Takam. There might be a chance we could see both fights: Joshua-Wilder and Joshua-Fury, with a Wilder-Fury fight also at least vaguely possible. But if you could see AJ fight just one guy in a Super-Fight; Wilder or Fury, which would it be? 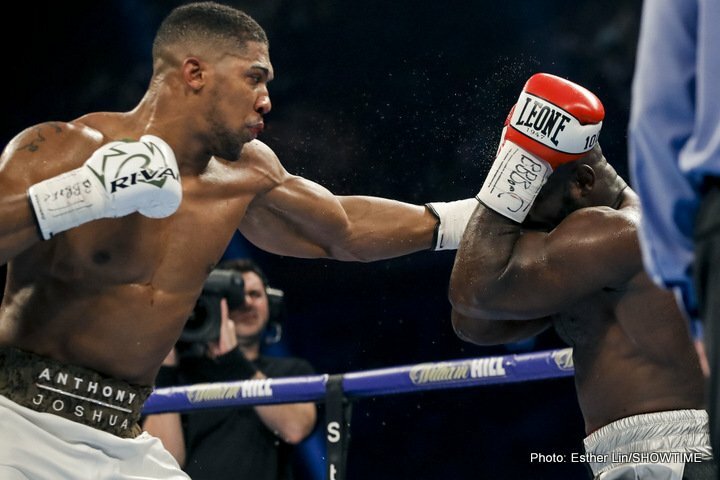 Joshua-Wilder has ‘bombs away’ and ‘sure-fire KO’ written all over it large, while a Joshua-Fury clash (the in-shape Fury of course) could become a fascinating match of boxing brains rather than physical strength and power. Fury has often said he would “play” with “body builder” Joshua, and if he turned up in the same mental and physical condition he was in when he upset Wladimir Klitschko two years ago, who knows, maybe “The Gypsy King” would box Joshua’s ears off. In an ideal world, we would see Joshua, Wilder, Fury and Parker mix it up, the winner of the rivalry declared and universally accepted as THE man at heavyweight. Maybe we will get lucky and this will indeed happen, but right now, being realistic, the only heavyweight Super-Fight likely to happen next year is one between Joshua and Wilder. Let’s see Tyson Fury get his act together, get the proper treatment he deserves from the boxing authorities, and get right back, bang in the mix. Previous boxing news: What next for Carlos Takam?